St. Bonaventure University appears in our ranking of the Top 10 Master’s in Counseling Degrees Online. The School of Arts and Sciences at St. Bonaventure University offers a Bachelor of Arts, Bachelor of Science, and Minor in Psychology and a Master of Science in Education in Counselor Education, Clinical Mental Health Counseling. The psychology and counseling degrees provide students with a strong foundation in the fields and enable them to develop the necessary skills to understand and assess human behavior, personality, decision making, mental illness, and various other topics. Students engage in research projects and high impact hands-on learning experiences, including internships, community service, field experience, and capstone experiences. The Bachelor of Arts in Psychology is intended for students wanting a liberal arts education with a major in psychology and various electives in natural sciences, humanities, and social sciences. The Bachelor of Science is Psychology is geared toward students seeking to combine the psychology major with a strong foundation in physics, mathematics, biology, chemistry, and computer science. Both programs require the completion of a total of 120 credit hours. The Bachelor of Arts program requires 35 credits of psychology and the Bachelor of Science 38 credits. The Bachelor of Science requires the completion of three cognitive, biological, health courses while the Bachelor of Arts requires two. The BS also requires a high math course. The required psychology classes for both programs include An Introduction to Psychology, An Introduction to Biopsychology, and Psychological Research: Methods and Statistics. The minor in psychology requires the completion of An Introduction to Psychology and Psychological Research: Methods and Statistics and four psychology electives. The Master of Science in Education in Counselor Education, Clinical Mental Health Counseling is intended for students seeking to pursue careers as counselors in community-based settings. The program provides students with research-based knowledge and skill development in individual and group counseling, testing, diagnosis and planning treatments. The degree requires the completion of a total of 60 credit hours. The required courses include Research Methods, Introductions to the Professional of Counseling, Advanced Human Growth and Development, Techniques of Counseling, Abnormal Psychology, Group Counseling, Multicultural Counseling, Management of Clinical Mental Health Programs, and Family and Couples Counseling. Students must also complete practicum, seminar, and internship components. The field experiences involve 40 hours of direct counseling experience. The internships each involve 300 hours of experience. Students are also required to complete a thesis. St. Bonaventure University is a private institution of higher learning located in St. Bonaventure, New York. It is affiliated with the Roman Catholic Church. It was established in 1858 as St. Bonaventure College, in honor of St. Bonaventure of Bagnoregio, who was the Patron of Franciscan Studies and Learning. It began offering graduate programs in the 1920s. It officially became a university in 1950. Today, St. Bonaventure University is home to more than 2,700 students on its rural 500-acre campus. It uses the semester-based academic calendar system. St. Bonaventure University is committed to providing values-based education that focuses on personalized attention and innovative programs. It strives to instill a passion for lifelong learning and following the Franciscan tradition. It offers more than 50 majors and all programs require the completion of the core curriculum, involving taking courses through the institution’s Clara College. The schools of Education include School of Arts and Sciences, School of Business, School of Education, School of Health Professions, and Jandoli School of Education. The most popular majors include biology, journalism, psychology, business, communication, and media. The student to faculty ratio is 12 to one and instructors are dedicated to making connections with students. About 54 percent of classes have less than 20 students. The U.S. News and World Report ranks St. Bonaventure University number 22 in its 2019 edition of Best Colleges is Regional Universities North. The Commission on Higher Education of the Middle States Association of Colleges and Schools regionally accredits St. Bonaventure University to grant bachelor’s and master’s degrees. The Master of Science in Education in Counselor Education, Clinical Mental Health Counseling is accredited by the Council for Accreditation of Counseling and Related Educational Programs. 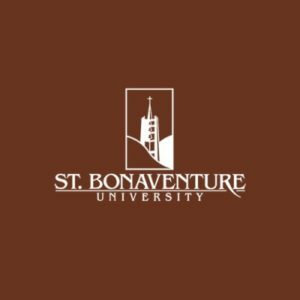 St. Bonaventure University offers numerous forms of financial aid to assist students in paying for postsecondary education, including scholarships, grants, loans, and work-study. Approximately 74 percent of full-time undergraduate students are granted some sort of need-based financial aid. The average yearly award is $24,102. Students who show financial need may be eligible for the Federal Work Study program. The program enables students to work on a part-time basis up to 20 hours a week while courses are in session. Jobs are available both on and off campus. Students are paid every other week and earn at least the current federal minimum wage, but pay varies by employer, position, and student qualifications. The psychology and counseling programs prepare students for a wide variety of careers in various areas including counseling, psychotherapy, teaching, experimental psychology, social and market research, data analysis, applied behavior analysis, art and music therapy, and testing and test development. The degree programs in psychology and counseling from St. Bonaventure University prepare students for meaningful careers where they make a difference in the mental health and well-being of a diversity of individuals. 15 Best Psychological Films of the 21st Century — So Far!